Pediatric symptomatic flatfoot problems are very common in foot and ankle practices. Although calf stretches and orthotics are effective for most patients, there is a subset of patients who require surgical correction. With time, the type and thoughts for surgery have changed and become more advanced. This has led to better short- and long-term results. Accordingly, let us take a closer look at the underlying causes of pediatric flatfoot ailments and appropriate procedure selection for improved outcomes. The first and by far the most important point to consider with any flatfoot correction is the underlying cause of the flatfoot and what is referred to as the plane of abnormal dominance. It is important to remember that the foot is a tripod. In order for the foot to work properly, all three parts of the tripod (in this case the heel, first metatarsal and fifth metatarsal) need to be on the ground at the same time. Furthermore, the posterior tendons, especially the gastrocnemius tendon and Achilles proper, need to be supple enough not to put heavy strain on the tripod, which can cause collapsing of the arch. When it comes to the clinical exam, one needs to consider the foot in both standing and sitting position. When the patient is standing, pay attention to the level of arch collapse and splaying or widening or the foot. Check the hindfoot position with the amount of heel valgus and lateral tarsal deviation. Realign the arch with the patient standing and check the amount of correction. Check the suppleness of the hindfoot and forefoot. Finally, check forefoot alignment while the hindfoot is in a corrected position. During the seated exam, check the tightness of the Achilles and gastrocnemius muscle group. Perform this with the patient’s knee straight and bent. If motion improves to neutral or better dorsiflexion with the knee bent, a gastrocnemius equinus is present. If there is little change in the ankle range of motion with the knee bent, an Achilles equinus is present. Again note the range of motion of the joints and check any concern for a possible coalition. In young children, the joints are so supple that it is often difficult to determine the presence of a coalition due to the range of motion of the surrounding joints. However, as coalitions are often one-sided, it is important to consider a unilateral flatfoot a coalition until proven otherwise. The most important consideration of the exam is to check the hindfoot to forefoot alignment. First, consider what type of hindfoot correction is necessary to realign the heel. Is the deformity mainly lateral deviation of the tarsals or a calcaneal valgus? After considering the hindfoot correction, one must address forefoot realignment needs. The main reason I see failures in pediatric flatfoot correction is correction of hindfoot deformity without attention to the forefoot. For example, if you are going to correct the hindfoot with a subtalar implant that will correct valgus heel position, you will increase the forefoot varus deformity. One must also correct the forefoot varus deformity in order to bring the first ray to the ground. If this goes uncorrected, the forefoot will have to reach the ground by collapsing, which will result in jamming of the implant in the subtalar joint. Always consider that a slide procedure of the hindfoot such as an Evans opening wedge or a calcaneal slide will decrease the forefoot varus in comparison to a rotation procedure like one would perform with a subtalar implant. After selecting the hindfoot and forefoot procedures, and considering the equinus concerns, one can proceed with procedure selection. • The Evans procedure is the single strongest corrector of hindfoot alignment in the pediatric population and does not worsen the forefoot deformity. • In very lax feet with severe arch collapse, one should consider a midfoot fusion over an osteotomy to realign the arch and decrease the chance of collapse. Naviculocuneiform fusions are better as there is an open growth plate at the first metatarsal base. • In a majority of patients, a gastrocnemius recession procedure is sufficient to increase the necessary motion at the ankle. If one is planning an Achilles lengthening, consider a three-incision percutaneous technique. • Use subtalar implants sparingly and in patients who require additional correction and stabilization of the hindfoot after bone work has occurred on the hindfoot for realignment. Remember that the subtalar implant procedure as a sole procedure is doomed to failure as you are guaranteed to increase the forefoot varus without treating the equinus. • Over-treat flatfoot cases. Six to eight weeks of recovery is standard for most procedures whether you do one or several so put together the right approach in order to avoid deformity recurrence or pain. The big questions are what procedure to choose and why. Our group has had exceptional outcomes with the use of Evans calcaneal opening wedges. This procedure is somewhat difficult to master but essential in most pediatric flatfoot corrections. As the growth plate is open in pediatric cases, I do not perform calcaneal slide procedures and use a subtalar implant when it comes to increased vaglus for varus hindfoot realignment, or in very supple feet for additional correction. 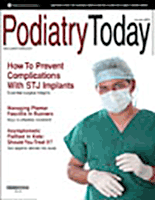 The forefoot is a more difficult treatment issue and procedure selection varies. If the midfoot is stable but elevated, I prefer to perform a Cotton opening wedge of the medial cuneiform. This brings the medial column down and the level of correction is easy to dial in properly at the time of surgery. Again, if the foot is very supple, I will consider a midfoot fusion procedure, which may include a naviculocuneiform fusion, a first metatarsocuneiform fusion or both in rare instances. Again, if you are performing a first metatarsocuneiform fusion, make sure the growth plate is closed. My preferred posterior tendon lengthening is an endoscopic gastrocnemius recession. I will release the medial head of the gastrocnemius first and see if motion improves. If there is still an equinus, I will then lengthen the entire gastrocnemius through the same endoscopic approach. In rigid deformities, I will often try a resection prior to a fusion procedure and have found subtalar implants an excellent option for hindfoot realignment maintenance after coalition resection. Again consider the equinus and forefoot at the time of hindfoot alignment. If there are severe arthritic changes or extreme collapse with a noted coalition and the child is over 14 years old, I will often perform a triple arthrodesis.